Veggie Mee Goreng (Fried Noodles) made with only vegetables and vegan ingredients. Easy veggie fried noodles recipe with ketchup, soy sauce, and lime. A few weeks ago, I had a small gathering and one of my friends and her family are vegans. I decided to make some vegetarian food for them. 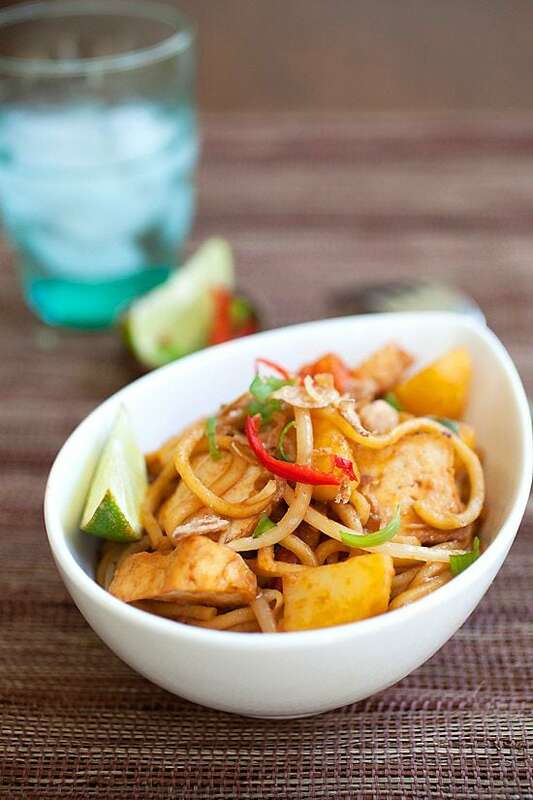 As my friend is from Malaysia, I immediately thought of mee goreng, or Malaysian fried noodles, which is a delicious noodle dish commonly found on the street. I decided to make veggie mee goreng for them and oh boy, I was so happy I did. The veggie mee goreng (fried noodles) was absolutely delicious and very popular, in no time, the noodle dish was gone. I guess everyone just loved the great taste. Unlike Chinese noodles or Chow Mein, Malaysian mee goreng is savory and zesty (from the addition of ketchup and squirts of fresh lime juice). Back in Malaysia, this noodle dish is made with spicy squid, potatoes, fried shrimp fritters, fried tofu pieces, and some boiled potato wedges. It was an easy conversion to make it the dish into vegan as I just had to opt-out the seafood. I added extra bean sprouts to make the dish lighter and more refreshing. As I said, squirts of fresh lime juice right before serving adds extra flavors to this simple and humble dish. Try this veggie mee goreng recipe and all your carnivore and omnivore friends will be delighted to eat it, too. Heat up a wok and pour in the cooking oil. Add the garlic and stir fry until aromatic then add the bean curd and potato and tomato wedges. Do a few quick stirs and then add the yellow noodles and the Sauce and continue stirring until everything is well combined. Add sugar and salt to taste. Add in the bean sprouts and quick stir for another 1 minute. Turn off the heat, dish out, garnish with the scallions, red chili, and fried shallots. Squeeze some lime juice over the noodles before eating. You can get fresh yellow noodles from Asian supermarket. Yellow noodles are yellow in color and oily. If you can't find yellow noodles, just use spaghetti. All photos and recipes on Rasa Malaysia are copyright protected. Please do not use the photos and recipes without prior written permission. If you wish to republish this recipe, please rewrite the recipe in your own words instead of copy and paste and link back to //rasamalaysia.com/veggie-mee-goreng-fried-noodles/. Thank you very much! Vegan mi goreng! I love the idea. And I’m sure it was a delicious treat for your friends… Looks good. Don’t forget extra sliced cilipadi at the side :) Thanks for sharing I will certainly try this soon. What are “yellow Noodles” an explanation note in the recipe would be so helpful. Yellow noodles are fresh Taiwanese/Hong Kong style noodles that you can get at Asian stores, they are yellow in color and coated with oil, so they are oily. I believe the yellow noodles contain egg…can you rec a non egg noodle that would go with your recipe? I love the yellow noodles, use them all the time – here in Sydney they are always called ‘Hokkien Noodles’. They have a distinctive taste and texture – I’m struggling to think of a good substitute, but one possibility might be Japanese udon noodles, which I’m pretty sure have no egg. Of the same thickness, our Vietnamese grocers here sell a tapioca noodle. Would like to have it as soon as i get a chance. Yellow noodles does not contain egg. It most probably contain a bit of yellow colouring. The ones that does not contain yellow colouring is light brown colour. 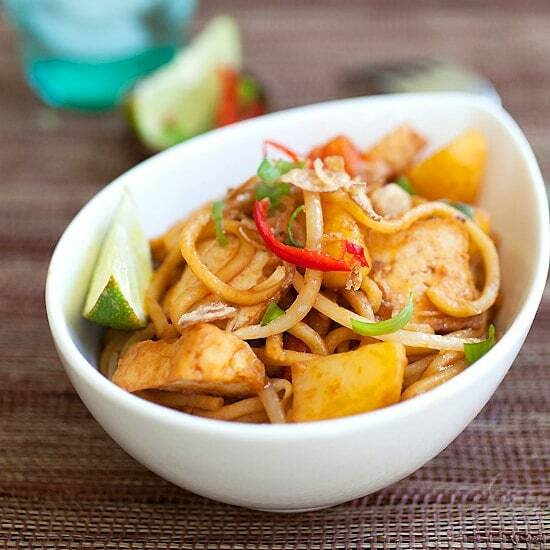 This recipe reminds me I have not eating mee goreng for a while, even though I live in Malaysia. Time to make my own with this recipe. I have been going to Malaysia (Malacca/Penang) for many years.Eat a lot of street food. Don’t mind the scrawny cats roaming between the tables. There is a big difference between Malacca and Penang Mee Goring. The defining ingredient is sugar. The Malacca Muslim/Malay style is not sweet. That is my preference. The Penang Chinese style is on the sweet style. So if you like to cook from the RasaMalaysia recipe leave out the sugar. And of course use the dry shrimp paste (balachan). Open the windows WIDE, exhaust on high, close all the doors in your house. Even better warm the balachan outside on a grill with pan. I love the odor but your neighbors might not…understatement. It’s difficult finding cockles and I shop on Clement St. in San Francisco. Sub manila clams chopped up. Or fly to Panang (the hawker stand in Ayer Itam local market is awesome) and gorge on it until you fly home. Can you use fresh tofu if you can’t find dry? Yes you can. Just deep fry them.